The Honduran Supreme Court has ruled unconstitutional a project to build privately-run cities, with their own police and tax system. By 13 votes to one, Supreme Court judges decided that the proposal violated the principle of sovereignty. Demonstrators celebrated the decision outside the court in Tegucigalpa. "This is great news for the Honduran people. This decision has prevented the country going back into a feudal system that was in place 1,000 years ago," said lawyer Fredin Funez. The government proposal to create some 20 "special development zones - as the new cities were officially called - was approved by Congress last year. The Supreme Court has now ruled that the law approved in Congress is unconstitutional, as it violates the territorial integrity of Honduras, as well as the sovereignty of the government. "I am sad. All the Congress wanted was to give jobs to all Hondurans," said Congress speaker Juan Orlando Hernandez. An American company was expected to invest US$15m in the initial phase of construction of the first city, on the Caribbean coast, the AP news agency says. 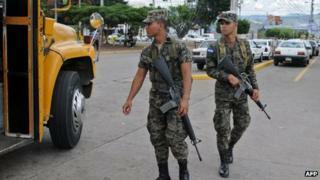 Honduras also struggles with violence. It has the world's highest murder rate - 92 murders per 100,000 people - according to the UN. The inspiration for his "model cities" were Singapore, Macao and Hong Kong, Mr Lobo said. But the opposition has accused him of being a traitor and trying to sell the country to foreign companies. Last month, well-known human rights lawyer Antonio Trejo was killed after speaking out against the project. He was shot dead by unknown gunmen outside a church on the outskirts of Tegucigalpa. Hours earlier Mr Trejo took part in a televised debate in which he accused politicians of using such projects to raise campaign funds.